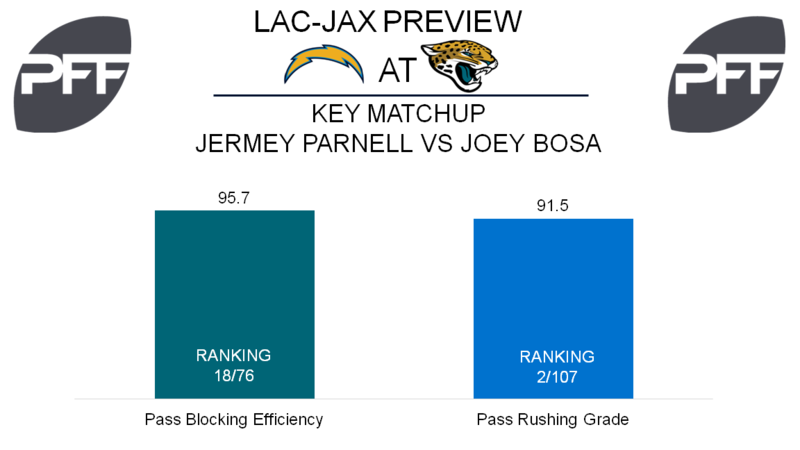 Chargers’ Offensive Tackles vs. Jaguars’ Edge Defenders – In recent years, the Chargers’ offensive line has struggled to keep Rivers upright. This year has been no different, with the unit posting a collective pass-blocking efficiency rating of 75.3 (24th in the league). Left tackle Russell Okung and right tackle Michael Schofield will have their hands full against arguably the best pass-rush unit in the league. Okung has a pass-blocking efficiency of 95.5, ranked 22nd out of 76 offensive tackles. Schofield’s mark of 88.8 is ranked 74th, just two spots away from last place. 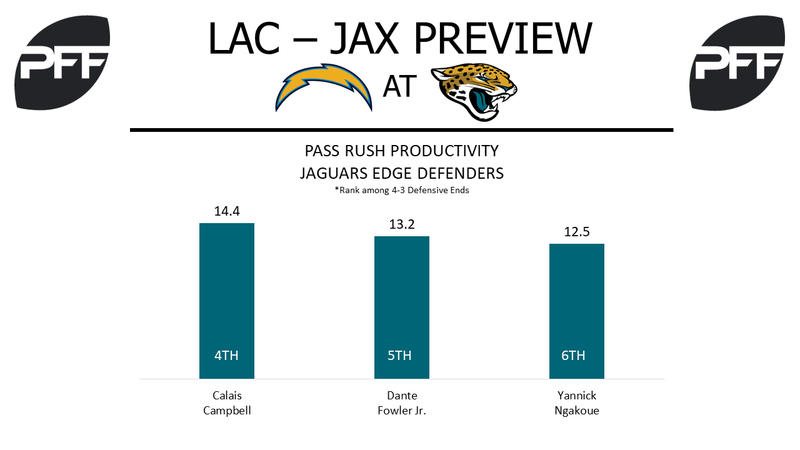 Meanwhile, Calais Campbell, Dante Fowler Jr, and Yannick Ngakoue all rank in the top six in pass-rush productivity (PRP) among 4-3 defensive ends. Campbell’s 14.4 PRP leads the group, with 41 pressures on 236 pass-rush snaps. If there is any good news for the Chargers offensive line, it’s that the Jaguars blitz only 20.7 percent of the time, nine points lower than the NFL average. However, Jacksonville registers pressure on 37.2 percent of passing plays in which they send only four pass-rushers. WR Travis Benjamin vs. Jaguars’ Safeties – Travis Benjamin has seen 39.4 percent of his targets come on deep passes (throws 20-plus yards downfield), which is the third highest rate among all wide receivers. On 13 deep pass targets out of 33 total targets, Benjamin has accumulated 132 yards, two touchdowns and no drops. Jacksonville’s last line of defense are safeties Barry Church and Tashaun Gipson, who have coverage grades of 82.3 and 86.5 respectively. Church is allowing an average of 0.39 yards per cover snap and Gipson is allowing just 0.28 yards per cover snap; both marks rank in the top 25 out of 83 safeties. With Benjamin being targeted on deep balls so often, Church and Gipson can’t afford to be caught flat-footed. RB Leonard Fournette vs. S Jahleel Addae – Between rehabbing an injury, the bye week and most recently a violation of team rules, Fournette hasn’t played in almost a month. Despite that, his overall grade of 82.3 currently ranks eighth among all backs, and should once again establish himself as the focal point of the Jaguar offense. Fournette has forced 25 missed tackles, but he has a tough task this week in Addae whose grade of 88.4 in run defense is fourth among safeties. Addae’s 13 run stops are second most at the position and he leads all safeties with 12 of those coming when within eight yards of the line of scrimmage at the snap. Addae has missed four tackles in run defense on the year so if Fournette is able to elude him, it could lead to big things in the second level of the defense. T Jermey Parnell vs. Edge Joey Bosa – After an impressive Week 8, Parnell’s grade rose up the tackle rankings, as his overall grade of 72.4 now ranks 35th. Parnell’s pass-blocking grade of 78.2 also improved, now ranking 18th at the position, while his pass-blocking efficiency of 95.7 ranks 18th having allowed 15 total pressures on 262 dropbacks. Bosa is back to showing the dominance he flashed during his rookie season. His overall grade of 89.8 ranks eighth among edge rushers, while his pass-rushing grade of 91.5 trails only his teammate Melvin Ingram. Bosa will switch sides during the game, but his 23 total pressures from the left side ranks tenth among 4-3 defensive ends. Parnell having another big performance will be essential in keeping a clean pocket for Blake Bortles. WR Marqise Lee vs. CB Trevor Williams – Despite Lee’s passer rating when targeted of 73.4 ranking 70th among wide receivers, Lee continues to have the trust of Bortles. Targeted 27 times over the last three games, Lee’s grade of 76.4 now ranks 36th at the position. Running the majority of his routes from the left side, Lee figures to see a lot of Williams, who has been a fantastic find for the Chargers. Undrafted in 2016, Williams’ overall grade of 87.5 ranks ninth among all corners. His 0.61 yards allowed per coverage snap ranks fourth among corners and his 17.9 coverage snaps per reception allowed is fifth at the position. This game is a great test for the Bortles-Lee connection as neither Williams nor Casey Hayward will let things come easy.